Nelson Dale went along to Forshaw Park in Sylvania Waters to the see who would break their season duck between the Greater Sydney Rams and Queensland Country. Here is his NRC match report, better late than never. 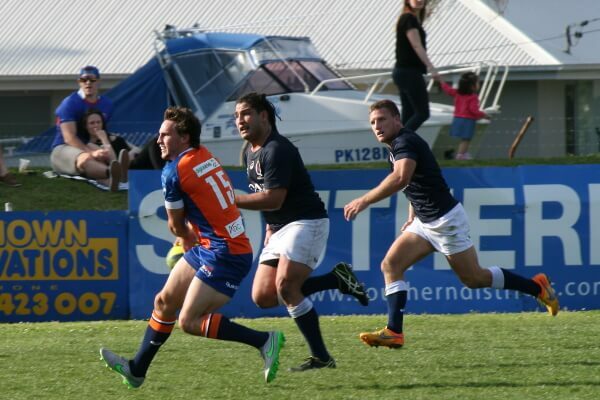 The National Rugby Championships (NRC) was taken to the Sutherland Shire for the first time during Saturday’s thrilling round 4 match-up, where Queensland Country beat the Rams 37 to 31. “RAMdemption day” which the event was preemptively dubbed by the Ram’s ‘Horned Army”, did not fail to entertain, however it was the boys north of the boarder who took home the bacon. For the second time this season, an underwhelming kicking game was the decisive factor that prevented the Ram’s for gaining their first ‘W’ of the season. With 5 tries a piece, it was Queensland’s Sam Greene who was more productive off the boot, in comparison to the home side’s Jai Ayoub, kicking 80% and 40%respectively. 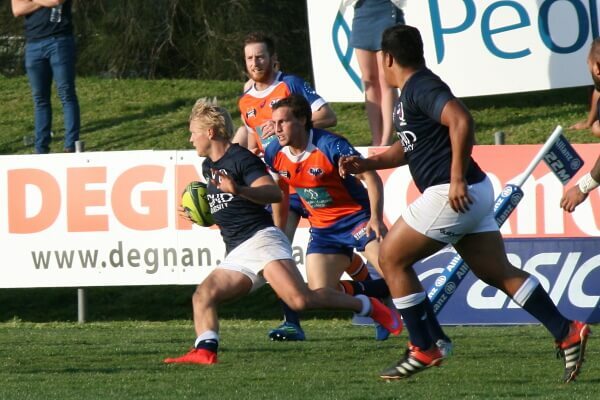 The other two result over the weekend also highlighted the value of kicking in the NRC, with NSW Country and Canberra Vikings both earning wins off the back of better kicking games. It wasn’t long before our Man Of The Match (MOTM), Greene, inserted himself into the game. He crossed first in the match, carving through the defensive line like a hot knife through butter to score. He added the extras to bring the score to 8-0 in the way of the visitors. Only moments later Ayoub slotted through the defensive line out wide, before drawing the last defender to put Brad Curtis over in the corner, for the Rams first try of the match. Some great support play and standoffish defense saw Queensland bring the score to 16-5, after winger Pierce Fitzgerald shimmied his way across the field before finding Saia Faingaa who was running hard unders line to score. The visitors were forced to soak up some pressure as the Ram’s local Southern Districts contingent, Jed Holloway and Paul Asquith, imposed themselves on the Queensland defense. A big Ram’s defensive effort followed, as they held off attack after attack on their own line. Before the half-time siren sounded, the Rams had their chances to reduce the deficit however falling short on a number of occasions due to strong Queensland defense. The home side did manage to have the final say of the half, crossing twice through locals Denny Godinet out wide and Jono Hayes off the back of a line out from a driving maul. A third unsuccessful kick saw the Rams enter for oranges down 15-16. The Rams came out firing after the break, striking first through Fili Tufui after some consistent pressure applied through pick and drives. Ayoub slotted his first conversion of the match, bringing the score 23-16. Queensland Country hit back only three minutes later, after receiving a penalty in the Ram’s 22, taking a quick tap to see Reuben Leilua barge over. Greene converted, edging the score back in the away sides favour at 24-23. Sam Greene slotted through the defense line, showing an impressive turn of pace to completed his brace in the 67th minute, before the Ram’s hit straight back from the kick-off, through Curtis’ second try, which was promptly converted. The home side was again in front on the score board 31-29 with only 10 minutes remaining. The final minutes of the match held as much excitement as anyone could have desired, seeing Queensland turn down a chance to level the scores through a penalty with an all or nothing attitude. 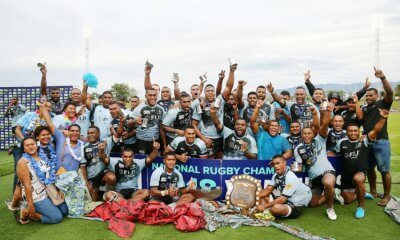 The risk and persistent attack was rewarded for boys from the bush, as they crossed for the final try of the match through Taniela “the Tongan Thor” Tupou. Greene converted his fourth of the match to bring the final score to 37-31. The Rams looked to come home strong, however it was Queensland Country’s choice to take a quick tap rather than level the scores which earned them their first ‘W’ of the season. Sam Greene was the clear standout of the match. He showed blistering pace, crossing for 2 tries and his 80% kicking accuracy proved the decisive factor in the 5 tries a piece result. He was involved in all aspects of the game and he demonstrated that is a true shinning light for the unconvincing Queensland Country side. Jed Holloway‘s NRC return provided Greater Sydney fans with a glimmer of hope. His barnstorming runs and defensive prowess would be at home in Super Rugby, where he is likely to make an impact for the NSW Waratahs next season. Brad Curtis was also solid for the home side, scoring a brace of tries. Tries: Brad Curtis 2, Denny Godinet, Jono Hayes, Fili Tufui. Thanks for the write up. 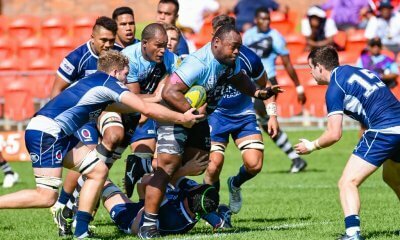 Fili Tufui seems a solid lock and was ever present in the tight. I thought the Rams scrum kept them in the match until the subs came on. Good game to watch. Very nice report and spot on about the value of a kicker. The Rams would have loved the boot on the other foot, pardon the pun (and it was the same in Perth). 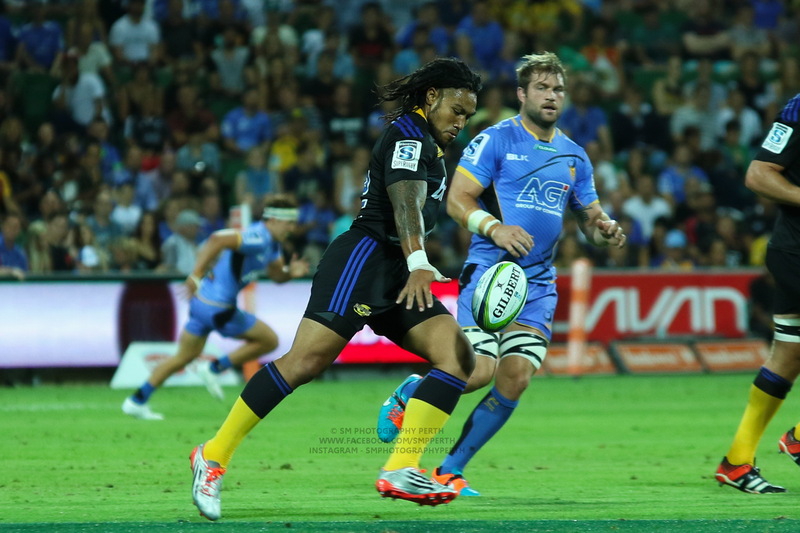 Holloway has the game to go further with the Tahs. The Reds have a couple of promising fly-halves. This NRC is delivering. Plus a shout out for Pedro’s action shots. The middle one with Greene (and is it Thor?) gets my vote. Any estimates of the crowd in the Shire? Cheers, it’s always fun to get out on the field on a nice sunny day with some great rugby to capture. I believe that is Thor, it’s definitely from late in the match when he was on the field. The crowd was pretty decent in size for the ground. I went with a mate who used to play for southern districts and he said it was as big or bigger than a finals match at Foreshaw. I’m terrible at estimates but my guess would be around one thousand. Furthermore the hamburgers and sausages were great. Top stuff. It’s good for the Rams to take these games to their clubs. Still early doors for this comp so spreading the love can’t hurt. 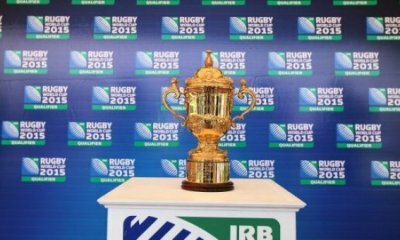 Good for rugby. Thanks mate, was a great game on a great day. Can’t confirm on any estimates, it was a pretty average crowd and I would say 1 thousand isn’t a bad guess. I was expecting a lot more to be honest. Also the photos are great Pedro. The original prop in a prop's body, but thankfully I have the rugby mind of a prop as well.